Sean Dyche felt his side showed two impressive sides to their character to claim their biggest win of the season at a rancorous London Stadium. 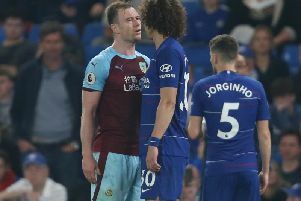 Burnley dug deep when not at their best in the first half to go in goalless, before Chris Wood came off the bench to make one for Ashley Barnes and score two, as the game descended into farce amid a series of pitch invasions from angry Hammers fans. Dyche said: “Really pleasing, the first half was below par, and they were good, we probably were diligent with the ugly side of the game, the shape and hard work saw us hang in there, because they had a couple of great chances. “But then second half I was so, so pleased with the mentality of the players, we spoke about it at half-time, and we felt the delivery would be important, and they certainly delivered. “The quality of the football was very pleasing second half, we just couldn’t find it first half. “You get to 40 points last week and that’s a big marker in what we’re looking to achieve as a club, and you then get that weirdness, which way does that spin? “First half it looked like ‘ok, that’s done, let’s just get through today’, and second half it looked like a stimulating performance where everyone said ‘look, let’s really take the game on’. The Burnley bench let some young Hammers fans sit with them late in the game to get out of the way of some angry protests, but Dyche wasn’t fearful for his players: “When people come on the pitch, I don’t think they’re, I can’t imagine they’re trying to be dangerous towards the players, they’ve got their own agenda, if they’re unhappy with the club and whatever’s going on. “But I don’t think the players felt unsafe. “It’s a tough situation for a player, no one wants to see fans on the pitch, but they be frustrated, I don’t think there’s any malice in players getting hold of them, they’re just saying ‘come on, get off the pitch’, a few of the players were trying to guide fans off the pitch. “Whatever is going on, let’s at least get on with the game. “Hopefully there’ll be better times ahead for West Ham. “The referee came over and there was some common sense. They were trying to slow the game down and I understood. There was a little delay to let it all calm down. And Dyche felt his side might have won by more after Barnes - in front of Austria head coach Franco Foda - had a goal disallowed for off-side when level: “There was a very minor off-side, I don’t think it was, with Barnesy, but we got over that disappointment, scored a really good goal, a top goal - a great pass from Matt Lowton, well, a long ball obviously, and a fine lay off. It’s a brilliant finish, but the lay off is fantastic. It’s just pure. “But its a hell of a strike.